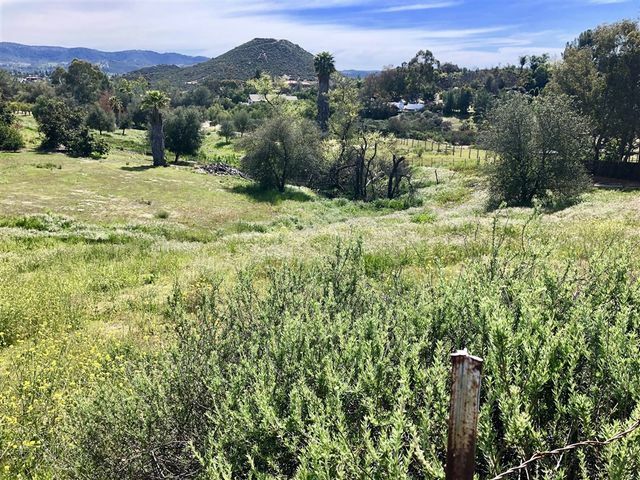 This 2+ acre property is ready to build! Comes with gorgeous views of the Valley, a water meter, Septic perc approved for a 3 bedroom home, fire hydrant right across, power at the property, and an easy in and out to town! Build your dream home on this spacious lot and fantastic neighborhood. Country living at it's best! Craftsman Design and Detail. Dramatic arrangement of formal rooms lots of space for your favorite activities. Bonus Loft and den plus downstairs guest suite. Master has retreat and outdoor balcony. Lovely Travertine downstairs, Gorgeous windows, lots of natural light, SS Appliances, Solar Panels Paid. 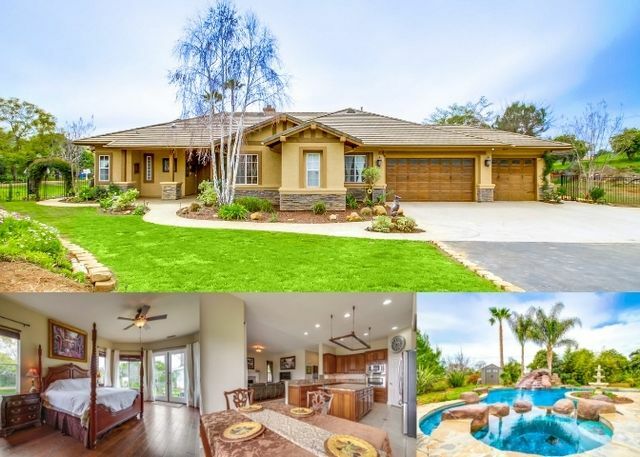 Located on the Woods Valley Golf Course with Magnificent Tree Lined greens. 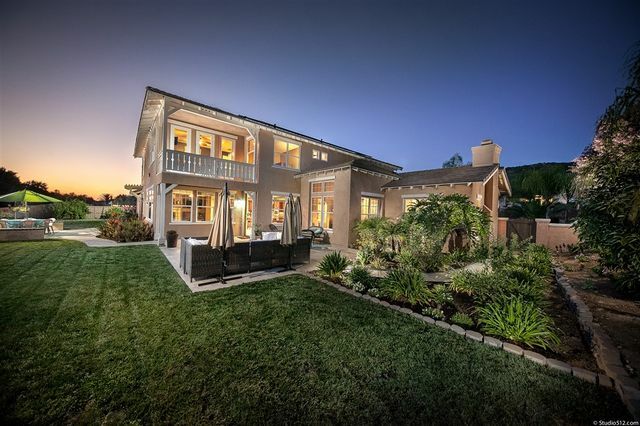 Over a half acre of use able space, beautifully landscaped. Come relax and sit by the fire pit, you wont believe the sunsets. 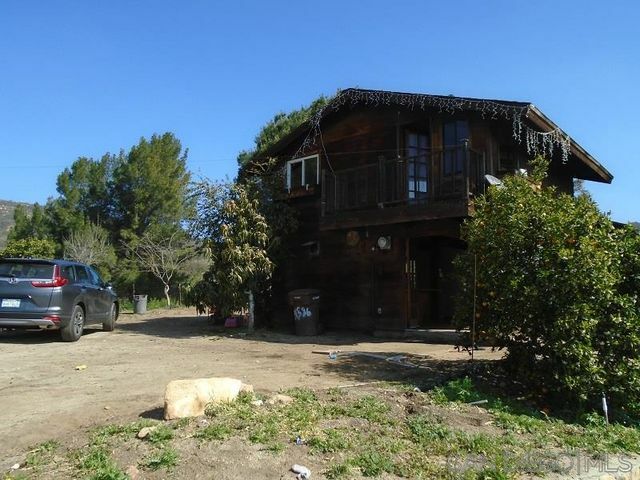 1-Story Beauty w/Detached Studio, VIEW, and 2.3 Acres in the Gated Community of "Valley View Ranch". Delight in the Below Ground Pool, Built-In BBQ & Outdoor Fireplace, multiple seating patios, and a "Meandering Garden" designed to enchant, as you get lost exploring every nook & cranny seeking fairies and adventure. The house is amazing, too! Wood, Slate & Tile Flooring throughout. Kitchen w/Granite Island/Counters, Pantry, GE Profile SS Appliances. Dual System Heating & Air. Read On. . . 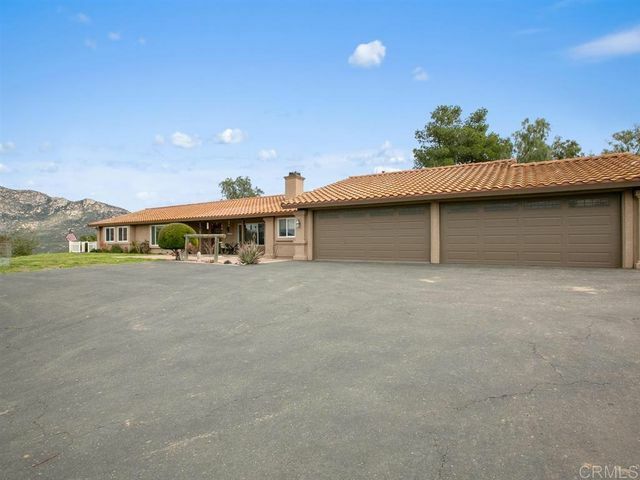 Welcome to the coveted, gated community of Skyline Ranch. This 2003 Palm Harbor Model is 1,716 sf, with 3 br/2 ba. It has an open-spacious floor plan, updated kitchen, vaulted ceilings, drywall w/ many upgrades. Master br has adjoining bath w/ garden tub & separate shower. EZ care lot, spacious carport w/ shed/workshop & lots of storage. Relax on the covered deck & enjoy the well maintained SCGA approved golf course. Many amenities include a pool, clubhouse, RV parking and FREE GOLF! SEE SUPPLEMENT! 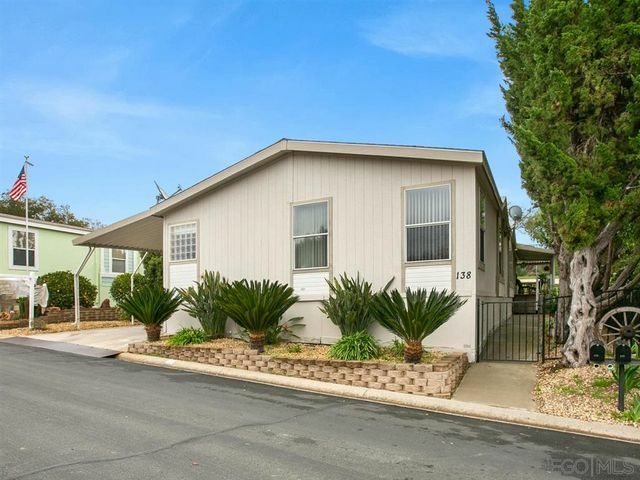 Seller will entertain offers between $799,000-$869,000. 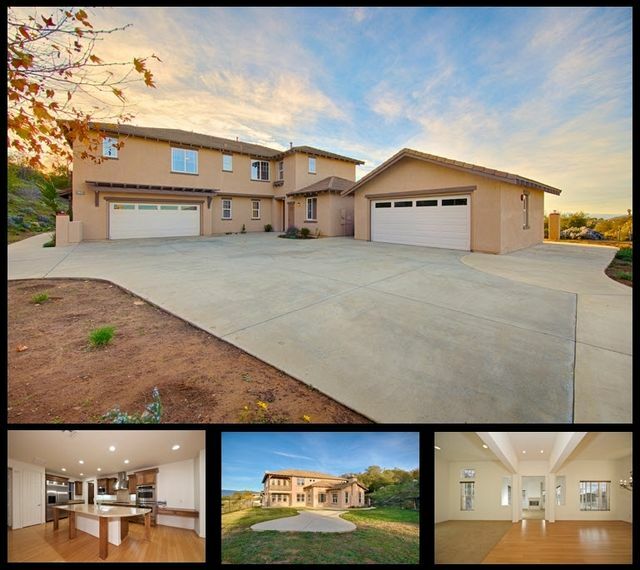 Tremendous value for this beautiful 5 bed, 4.5 bath home with stunning panoramic views. 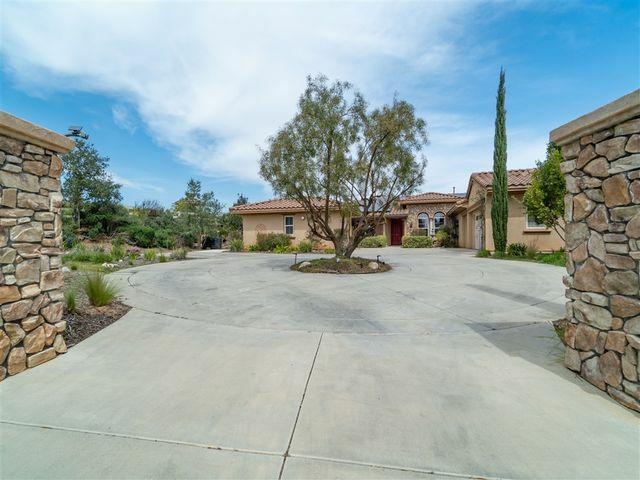 Sitting on 7.74 acres of land beneath the canopy of Palomar Mountain, this beautiful 2 story home boasts an open floor plan and endless possibilities! Upstairs find a large master suite w/ sitting area & walk out patio, Jack-n-Jill suite, loft & private bedroom suite. Downstairs find the main living area, dining room, study w/ fireplace, kitchen and so much more. A MUST SEE!!! Spectacular views everywhere you look in this custom home in the highly desirable Ridge Ranch development! Two large master bedroom retreats, a private detached guest house not included in Sq. Ft. 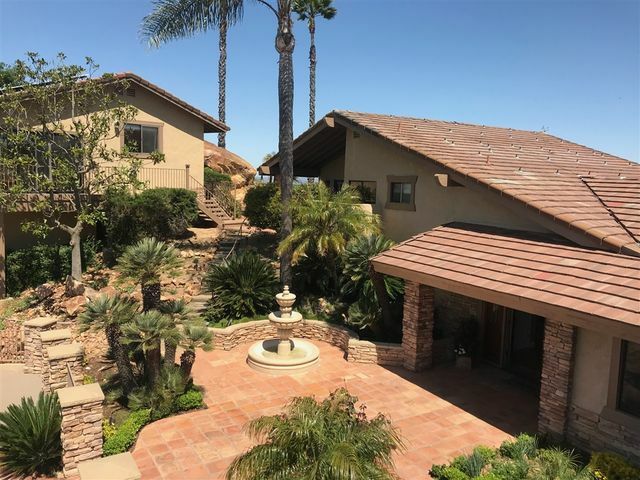 Wonderful pool and spa nestled among the natural red rock formations in the hill with large entertaining spaces along entire back side of the home. Beautiful kitchen, inviting fireplace, avocado and citrus trees, peaceful and serene location! Over 4.2 acres with lots of space, owned solar! Beautiful hilltop 4br family home on fully fenced 4.1 useable acres. Custom touches start with the front door and continue on throughout the home. Large master suite with fireplace, upgraded cook's kitchen w/ professional style duel fuel appliances, stone fireplace, full surround sound, and forever views out of the windows. This home was built with efficiency in mind with paid for 8.7kW solar, double insulated roof, electric tankless water heater, pre-wired for generator hookup, and plenty of parking!